The complete oil-based sludge treatment system recently produced by GN Solids Control is ready for delivery. GN Solids Control has injected more essence into the quality assurance and technology of the oil sludge treatment system. The complete oil sludge treatment system is now available. Successful operation in many countries at home and abroad, oily sludge treatment system is widely used in waste sludge oil sands generated by crude oil tank cleaning, waste sludge oil sands in refineries, drilling waste oil sands and other fields, bringing many customers Good economic and social benefits have won the favor and praise of our customers. The oil-containing sludge treatment system mainly includes: the heating pre-mixing tank system is mainly pre-mixed by heating and chemical demulsifier, and then pumped into the vibrating screen for large particle sieving treatment. The oil slick system mainly extracts the oil from the upper part according to the principle of gravity settlement. The solid-control separation system is mainly the sieve separation of the shale shaker and the two-phase separation of the centrifuge. Based on the state of the sludge on the part of the site, it may be necessary to add a chemical before entering the centrifuge. The secondary cleaning tank and the secondary separation centrifuge are mainly The material is further washed and further separated by two phases. The three-phase disc separation centrifuge mainly separates oil, water and mud. The oil-water separator mainly separates the oil and water. The oil and water will overflow to the corresponding buffer tank respectively. The oil pump and the pump will clean the oil and water. Delivered to tanks and tanks. The water purification equipment is to further purify the water again. The shale shaker and solid-controlled decanter centrifuge produced by GN SOLIDS CONTROL are sold to Russia, and the shale shaker and solid-controlled decanter centrifuge will be sent to the Russian oil field for drilling mud treatment. This time, Russian customers learned about the shale shaker and solid-controlled decanter centrifuge products, and chose to cooperate with GN SOLIDS CONTROL to sign a procurement contract. It took only a short time. Russian customers learned about equipment and compared with domestic counterparts. After that, I believe GN SOLIDS CONTROL has advantages in the domestic oil drilling industry and solid-liquid separation. 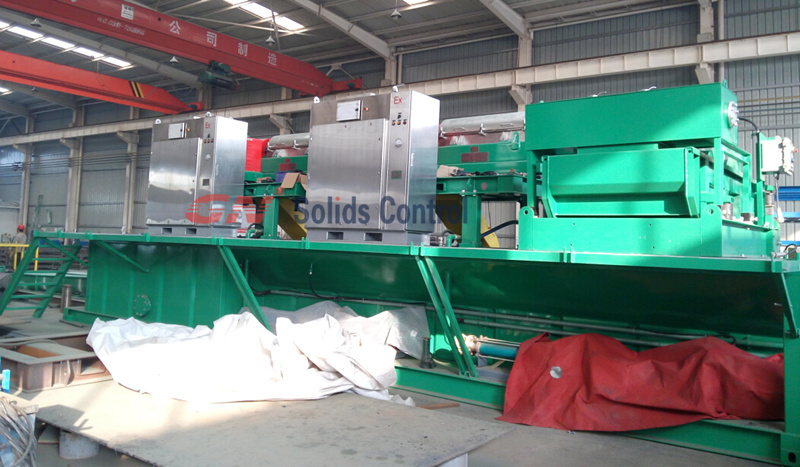 The shale shaker and solid-control decanter centrifuge produced by GN SOLIDS CONTROL can provide different processing capabilities and customized products according to the needs of customers. shale shaker and solid-controlled decanter centrifuge are the first-level solidification of oil drilling mud solid control system. 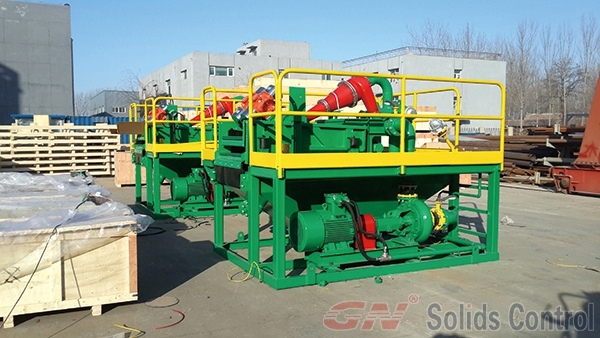 Phase control equipment and four-stage solid-phase control equipment, GN SOLIDS CONTROL produces a wide range of shale shaker, which can be applied to mud processing of trenchless HDD, water wells and mining core drilling to meet the compact separation of small throughput. The requirements of the purification system can also be applied to oil and gas drilling, large-scale non-excavation drilling rigs, and screening treatment in industrial separation, which can meet the requirements of large-capacity mud system. The double-layer sieve produced by the company can also be applied to the screening treatment of piling shield construction mud treatment and industrial multi-stage separation. The solid-controlled decanter centrifuge produced by GN SOLIDS CONTROL separates the drilling suspension according to the principle of centrifugal sedimentation. The suspension enters the drum from the feeding tube through the liquid outlet hole of the auger, and the solid phase particles are under the action of centrifugal force. It is pushed to the inner wall of the drum, and is pushed out to the small end of the drum by the blades on the auger, and the liquid phase overflows through the overflow hole at the big end of the drum. This continuous cycle, in order to achieve the purpose of continuous separation, can be very good to meet customer site requirements. GN SOLIDS CONTROL wholeheartedly welcomes friends who are interested in our products to visit our factory and negotiate cooperation intentions. We will serve you wholeheartedly. Recently, GN Solids Control completed the manufacturing orders for a batch of solid control equipment from customers in Uzbekistan. These devices are now undergoing final factory inspection and test operations, and these devices will then be sent to Uzbekistan. Today we take a look at what GN Solids Control has for customers that are designed for use in solid-state equipment operating at low temperatures and cold temperatures. Shale Shaker and mud cleaners are the first and second stage separation devices in the solids control system. It is understood that the drilling fluid used is back from a large number of drilling debris in the well. A vibrating screen is used to remove coarse chips from the drilling fluid. The mud cleaner of the subsequent equipment is to separate finer-sized cuttings. A vibrating screen is a solid particle separation device that separates the liquid phase from the liquid phase based on the diameter of the cuttings and the pores on the screen. The mud cleaner uses a centrifugal principle to separate solids and liquids. GN-type cuttings vibrating screen and mud purifiers are the leading solid-state control equipments in China and have the following advantages. 1. The structure of the vibrating screen is simple, but it is heat-treated in the production process to achieve the purpose of structural strengthening. 2. There are additional horizontal beams on both sides of the vibrating screen deck to withstand higher G forces. 3. The vibrating screen mesh adopts composite material frame, which has long service life and large screening area. 4. The bottom frame of the vibrating screen frame is made of stainless steel. 5. The composite damping spring is covered by rubber to prevent rust and protect the operator’s operation. The centrifuge is a GNLW363 model with a drum diameter of 14 inches and a maximum working speed of 3200 RPM. This model is a very popular model in the drilling fluid recycling and waste cuttings market in the petroleum industry. The drum material is duplex stainless steel 2305, which has better processing performance than SS316L. The spiral is protected by a tungsten alloy, and the solid discharge port is made of a hard alloy material, which prolongs the service life of the equipment, reduces maintenance, and brings greater benefits to the user. GN Solids Control has established good relationships with customers in Asia all the year round. The mud mixers and mud transfer pumps ordered by customers in this Asia are urgently needed on site. GN Solids Control’s employees are intensified according to the actual needs of Asian customers. It is required to successfully complete the processing test machine of the agitator and the mud transfer pump with the guarantee of quality and quantity during the delivery period. During this period, Asian customer supervision visited the site to check the production process and work progress. After the customer saw it, the professionalism of GN Solids Control products was praised and the professionalism of GN Solids Control employees was praised. The agitator ordered by Asian customers adopts worm-worm reduction gear transmission. The shaft section is a circular-arc cylindrical worm. The turbine tooth shape is a circle conjugated with the turbine. It has the advantages of large transmission torque, stable operation and reliable operation. The agitator produced has a compact structure, a small floor space, a good stirring effect, a large stirring intensity, a wide spread range, and a reduced starting resistance distance. The mud pump delivered by Asian customers mainly includes Centrifugal pump, vacuum pump and screw pump. The sand pump is designed for pumping drilling fluid or industrial suspension. Compared with ordinary pumps, it has excellent performance, large equipment flow, high temperature resistance on site, long service life, easy maintenance on site operators, high reliability and remarkable energy saving effect. Features. The vacuum pump transports more than 80% of the solid phase and high specific gravity materials at high speed. It is widely used in the transportation of waste mud from offshore platforms. The drill cuttings from the vibrating screen, the bottom of the sludge, the bilge cleaning of the ship, the sand, the fine sand. , and fracturing sand and other fields. Screw pump accessories are few, compatible structure, small size, easy maintenance, rotor and stator are the wearing parts of the pump, easy to replace. The screw pump stator is made of synthetic rubber and has special advantages over other pumps in transferring waste slurry of high viscosity and hard suspension. Nine Shale shaker produced by GN Solids Control are sent to Shandong. The nine vibration-free motor vibrating screens produced by GN Solids Control will be used for primary screening of solid drilling control systems in Shandong customers. The previous GN Solids Control has been We have had many cooperations with customers in Shandong. The customers are very satisfied with the processing effect of the ordered vibrating screen. 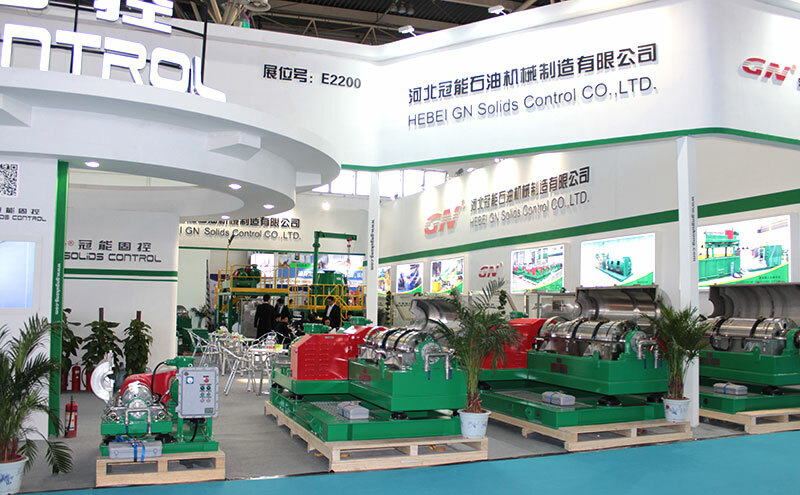 Therefore, we have chosen to cooperate with GN Solids Control again. The vibrating screens produced by GN Solids Control can provide different processing capabilities and customized vibrating screens according to the needs of our customers. Vibrating screens are the first-level solid-phase control equipment for oil drilling mud solid-control systems. 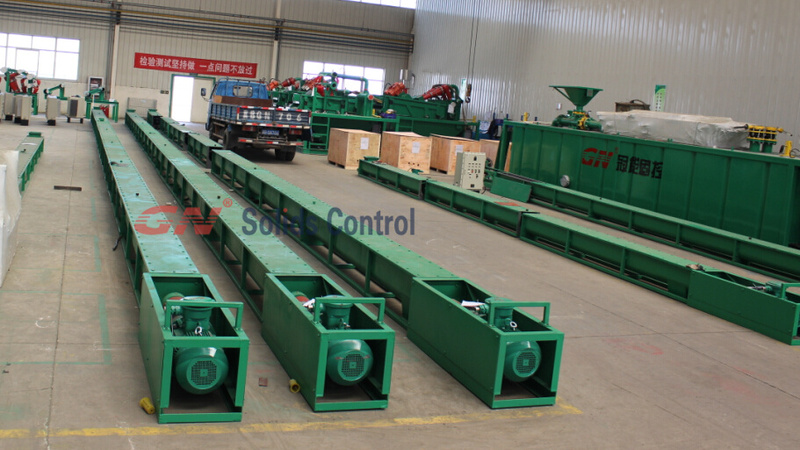 Usually GN Solids Control can be customized according to the size of the customer’s drilling rig. Different production of single vibrating screen, double vibrating screen or triple vibrating screen. At the same time, the vibrating screen produced by GN Solids Control can also be used as the bottom vibrating screen of the desander and desilter, or as the underflow vibrating screen of the sand removing and decontaminating machine. The vibrating screen electric screen box angle adjustment produced by our company, as well as the mechanical angle adjustment for standby, the screen box sealing patent design, the sealing effect is good, the bottom frame of the screen box is made of stainless steel, the corrosion resistance and the service life are greatly improved, the vibrating screen is electronically controlled. The electrical components of the cabinet use Siemens or Schneider components. The vibrating screen is mainly composed of a base, a screen box, a screen, a logging tank, an excitation motor, a shock absorbing spring, a control switch, and an adjusting device. Judging from the use of various types of vibrating screens used in current oilfield production, the most widely used linear drilling fluid vibrating screen has the advantages of high sediment discharge speed, horizontal installation of sand surface and large processing capacity. 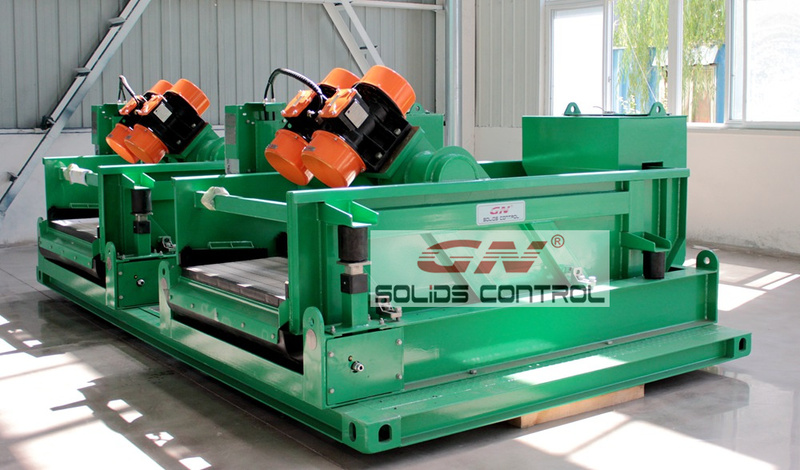 GN Solids Control is a professional manufacturer of mud vibrating shaker screens. The mud vibrating screens are widely used in oil drilling and HDD non-excavation industries. Welcome customers to consult. Decanter centrifuge is one of GN’s main products that widely used in all kinds of drilling mud recycling and waste management. This week, GN just finished the fabrication of the variable speed decanter centrifuge ordered by an India drilling contractor. Almost all the drilling contractors request the equipment used on oilfield to be explosion proof certified for safety consideration. To meet the customers’ requirement on explosion proof standard, GN is now able to provide equipment with motors and control panel certified by China national explosion proof CNEX, IEC Ex and ATEX. The ordered decanter centrifuge is GN’s model GNLW363C-VFD. The bowl diameter is 14 inch (360mm), bowl length and diameter ratio is around 3, which explains the model of the centrifuge. GN’s 14 inch decanter centrifuge can be used for various purposes due to the VFD design. The typical working speed of this model is 3200RPM, at this speed, the fine solids with size down to 2-5 microns could be separated out without adding additional chemicals. By reducing the speed to around 2000RPM, this unit can be used for barite recovery in solids control system. The bowl material of this unit is duplex stainless steel 2304 which is much better than SS316L. The centrifugal casting technic makes the bow material has a better distribution feature for better balance. This unit is equipped with temperature sensor at both bearing seats to inspect the temperature of the bearing. And a vibration sensor is installed on the base for abnormal vibration. All the sensors are used to collect information of centrifuge running and send signal to the VFD control panel. By uploading program into the VFD panel, the panel could monitor the centrifuge and trip off the unit for protection. The VFD control panel matched to the centrifuge has 3 VFDs for main and back motors of the centrifuge and the feeding pump. Operators could set the running parameters on the HMI screen to adjusting the centrifuge running condition. GN’s VFD panel is positive pressurized explosion proof method, together with the air conditioner, the VFD panel could be used in hazardous are with very high ambient temperature. Both the decanter centrifuge and control panel are made by GN self. For more information on GN’s decanter centrifuge and other mud recycling equipment, please feel free to contact with GN. 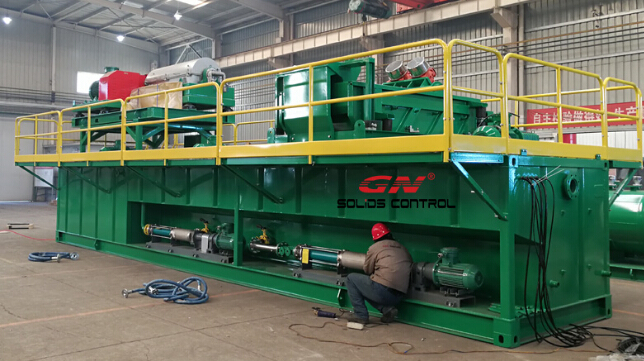 GN solids control specializes in the development and manufacture of drilling mud solids control systems and drilling waste treatment equipment. GN solids control is the leading brand of solid control equipment at home and abroad. We have established branches in the US and Russia. The use of cuttings collection tank, screw conveyor, drill chip dryer, and cutting chip solidification system is beneficial to the treatment of different solid control systems under the condition of a drilling drill to discharge waste cuttings and carrying mud or running pulp. The harmless treatment of the drill cuttings with mud is also conducive to the rapid drying and semi-automation of cuttings treatment. It is easy to realize the safe disposal of cuttings and realize the clean production of drilling. The waste slurry generated by cementing and clearing can be broken and stabilized by a high-efficiency composite type breaker. It realizes fast and efficient solid-liquid separation of waste mud, saves floor space, and can fully realize the rapid gel breaking and stabilization treatment of waste mud. The mud centrifuge processing module will be separated and dehydrated by adding waste mud such as gel breaking and flocculation. The initial rapid separation of the mud water is achieved, and the effluent is relatively clarified and the mud cake is formed. The sewage separated by the centrifuge is subjected to flocculation oxidative decolorization and emulsified oil demulsification separation treatment through a first-stage high-efficiency shallow air flotation device. Realize the flocculation separation, oxidative decolorization and petroleum-based removal treatment of small and medium organic matter in drilling wastewater. Then use high-fiber ball filter for high-precision filtration treatment to achieve wastewater reuse or efflux standard treatment.